Fact: People who consume a higher level of vegetables and fruits half their chances of cancer! Save money lah, medical bills very expensive now. Get your priorities right. You can die but you can’t fall ill.
Mercy Fate Swirl looks a bit intimidating and secretive on the outside. You can’t peek in the windows, everything is blocked. If you’re not familiar with buddhism, it can also be quite scary inside. The main colors–bright red and bright green–instead of giving a Christmasy atmosphere, seem to clash with each other uncomfortable. At a corner, there is a raised platform, like a bed, cramped with books along the wall. Rows on buddha idol in gilt-gold reflect the spotlight, giving an eerie gold glow to the place. The quietness of the place, interrupted only by a monk on tv talking about buddhism, can be quite discomforting. The whole time, you could see the look of disdain on 14K’s face. BUT the family who owns this restaurant is so friendly that any form of misapprehension was immediately dispersed. It’s run by a father-mother-son team. When we went in, the father and son immediately welcomed us and taught us how to order. The menu changes everyday, so the menu is on the blackboard. The choices were rather limited; 14K and I ordered everything on it. You order from the counter first, take your cutlery by the side, and take a seat for them to send you. You also take your own drinks from the fridge. Or take your own water from the water filter machine, at $0.40 a glass. Usually I’d mind spending money on water, but since the food here is relatively cheap, I didn’t mind this time. The Mother asked us why we walked in. “Then why haven’t you heard of us?! 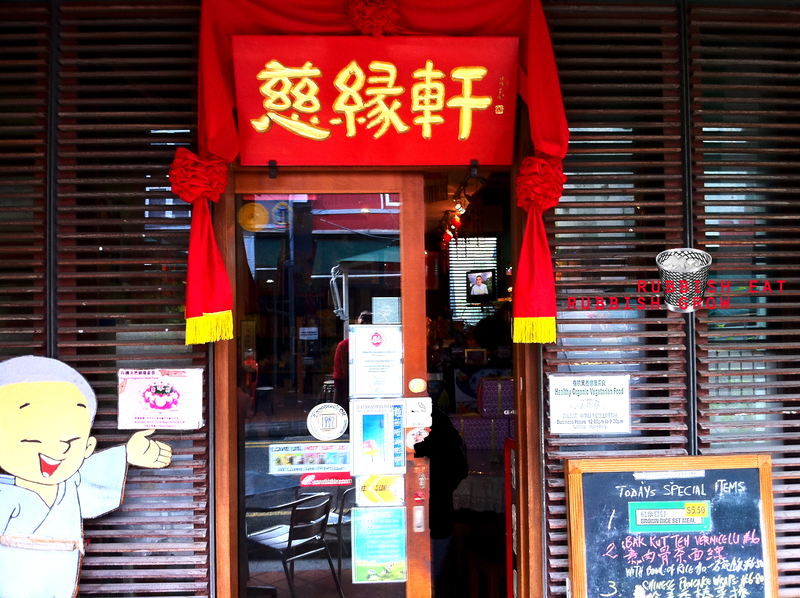 We’ve been here for 16 years!” And she went on to relate the history of Chinatown. She’s very interesting with the anecdotes of Chinatown. 14K hinted, “You see, even though she’s pushy, she’s friendly, so people still like her.” Which means I’m pushy but unfriendly!!! I GOT THE HINT. Thanks. The Mother also told us the ingredients she uses are all organic and even the soy sauce, which costs $55 a gallon. $55 a gallon for soy sauce. That’s more expensive than oil! Yet for all the high cost price, the food was superbly priced, with a main course about $5-$6. I feel like I’m robbing them. 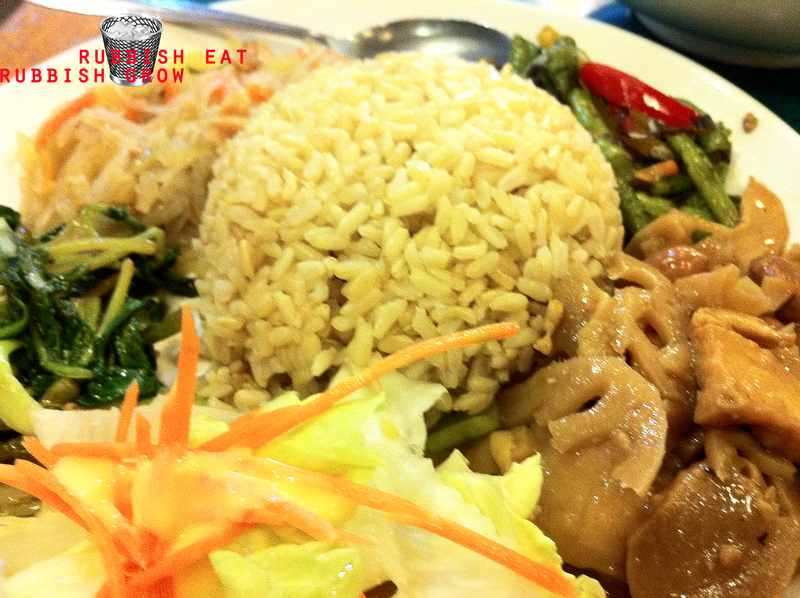 Brown rice set ($5.50). It looked very crappy but my eye lit up after I took a bite. LOVE IT. The organic brown rice, imported from Australia, was especially tasty and fragrant and sweet, and wasn’t the normal hard texture. The dish is great just of the freshness of the ingredients. I love it that there wasn’t any mock meat; what’s the point of having mock meat for vegetarian meals? I don’t really like raw vegetables, and the rest of the vegetables were homecooked standards. The one that stood out for me was the lotus-roots with braised tofu (bottom right). Meat changes the taste of soya sauce, giving it an oily, sweeter taste and the braised lotus roots-tofu tasted as if there was meat in it, giving the dish a very well-rounded taste. 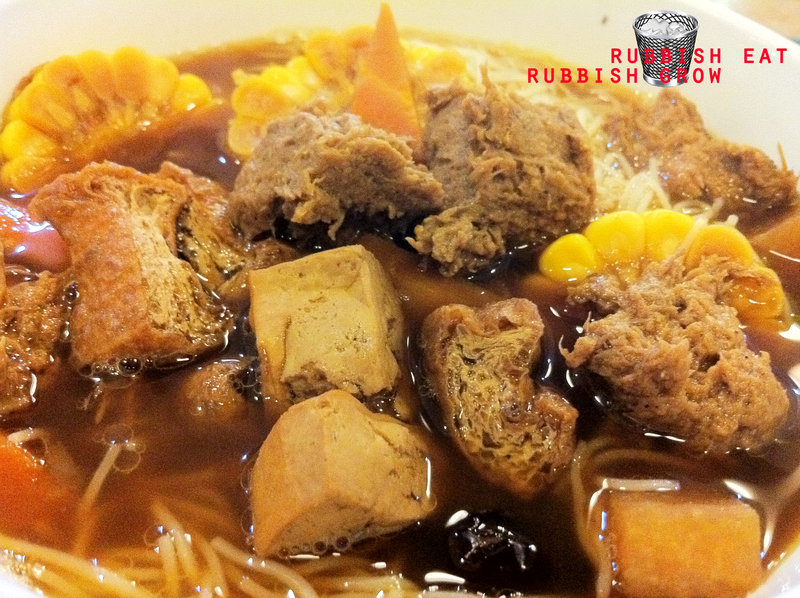 Vegetarian Bak Kut Teh Vermicelli ($6). 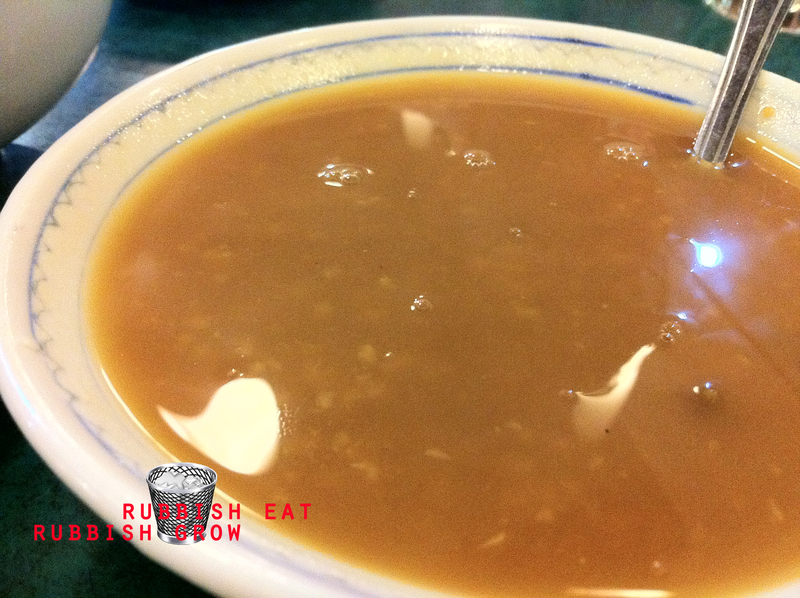 I don’t like bak kut teh, but comparing this to the meat one, this is much lighter, without garlic even? It was almost bland… but the more I ate it, the more I got hooked on it. It was very light, and just felt very good eating it. Dessert: Green Bean Millet ($2). Whenever my mother cooks green bean soup, it will ALWAYS be charred. She leaves the fire on, forgets and goes to sleep. One day, I’ll become a roast pig in my sleep. And this green bean millet tasted like my mother’s charred green bean. I suspect it’s the millet that gives it a roasted taste, but it is something I don’t like. Banana Walnut chocolate-chip muffin.We saw the Son take two trays of freshly, steaming hot muffins out into the restaurant to cool. And immediately ordered one. Actually, there wasn’t the freshly baked aroma and the muffin did look sickly, so I didn’t expect it to be delicious. But it turned out to be surprisingly pleasant, not mindblowing. 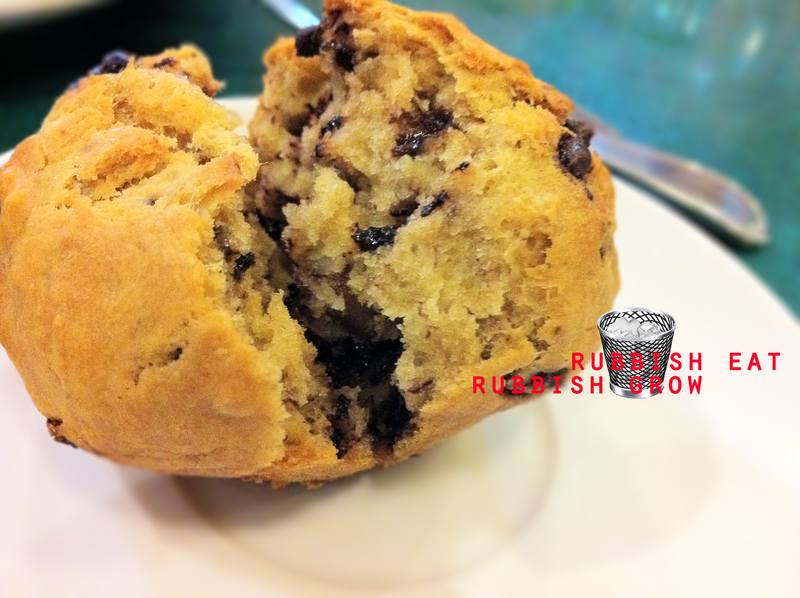 It’s healthy, not as sweet as other muffins, and the chocolate chips were ample. One lesson I learn from here is don’t judge from appearance. The food is healthy and has a homely quality, made with dedication and for the sake of people’s health. Usually after a full meal, you’d feel bloated, and drowsy and gross but when we left the restaurant, we felt energized and light and gay. I bet no MSG is used, less salt and less oil. The friendly family environment and the healthy and delicious food made me wish I was part of their family. Despite 14K’s great disdain for the decor, evident for the ingrained sneer on his face at the moment he stepped in, he left being impressed and said that we would definitely be back. nice! 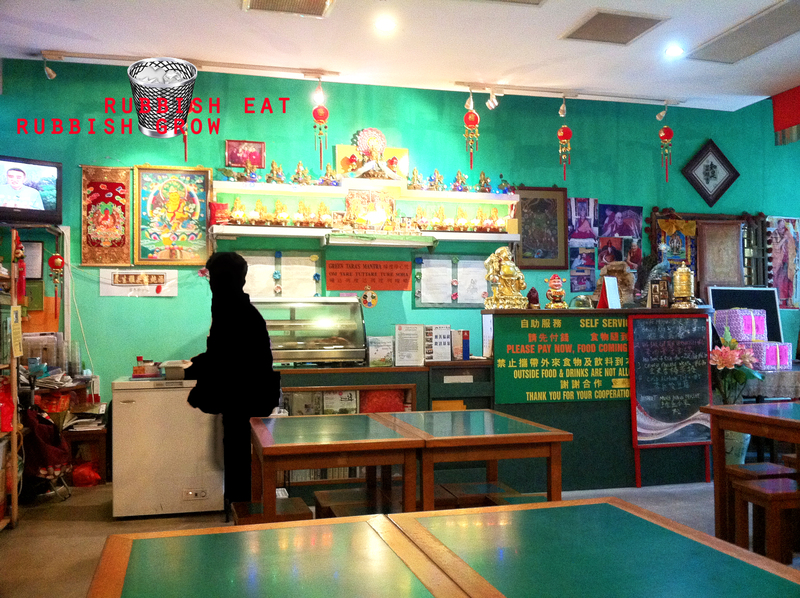 wonder my sis ever tried tis place, wil ask her to go wif me wen i’m on vege during 初一，十五。。o(∩_∩)o u every Tue eh? 佩服。。佩服。。hmm.. muffin here dunno got egg or not..
hm.. good question. I think should have? 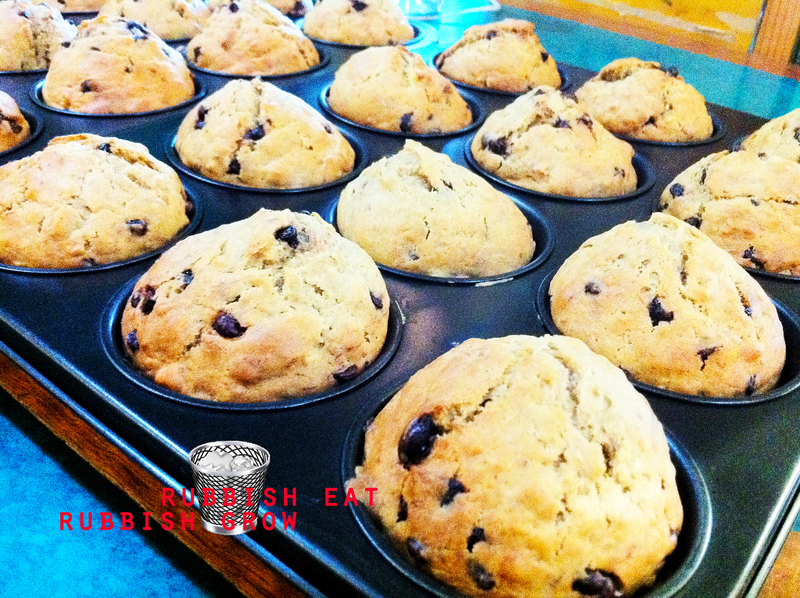 hard to make muffin without eggs?